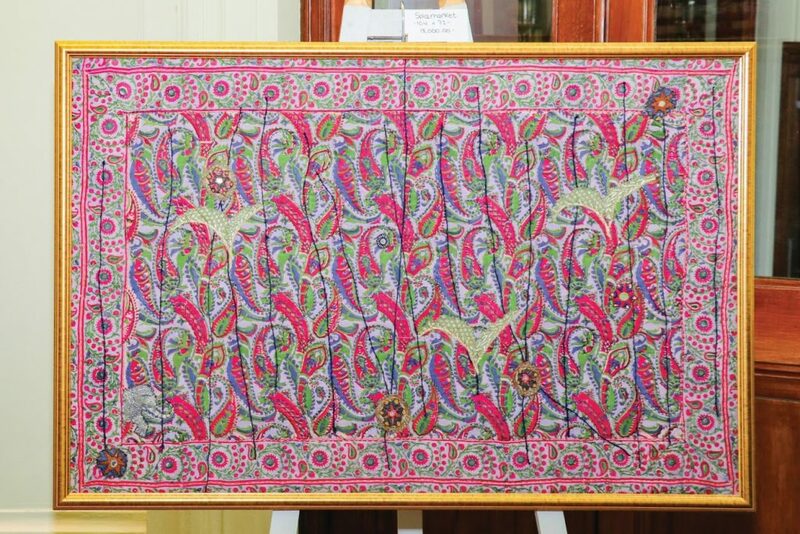 Self-taught fabric artist Olivia Jhingran weaves magic with her compelling works of art that transform second-hand Indian saris into a canvas for pictorial tales. “It all started as a hobby,” Olivia Jhingran explains as she takes me around the room where her first exhibition, titled ‘Leafy,’ was held at the Neilson Hays Library last month. “I married young and became a stay-at-home mum. I had a lot of spare time, so I started by making bedcovers, and then discovered I really enjoyed creating stories using quilting methods.” Having trained as a fashion designer at Neue Kunstschule Zürich prior to her marriage, Olivia was equipped with the fundamental principles of design, and the practical know-how needed to execute them, well before she began experimenting with fabric artistry. Working primarily with silk saris, this warm and friendly artist has an innate eye for colour and enjoys coming up with unique concepts. Her portfolio consists of pieces that are infused with a sentimental nostalgia, focusing on elements of daily life, scenes from nature and treasured memories. 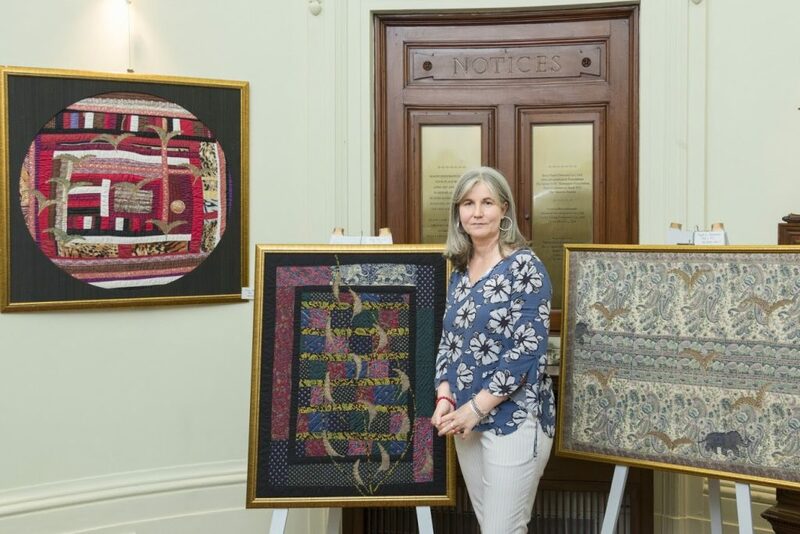 At her exhibition, a few of her creative designs stand out for their eye-catching aesthetic and out-of-the-box approaches. In Mystic Garden, she conceived a fantasy world full of tranquil blue and blushing pink hues, where elephants roam free. In Loosen Up, she combined her husband’s tie with strips of her much-beloved saris, while Spice Market delights the eye with its bright reds representing a basket of chillies for sale in a busy bazaar. 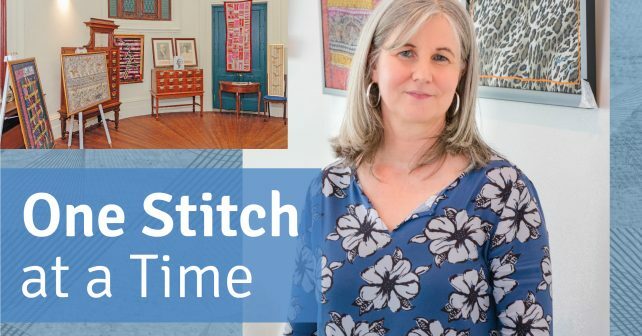 While she walks me through her various pieces, all of which would make great decorative additions to any home, Olivia shares her journey: from patching together her first piece to hosting her first exhibition. 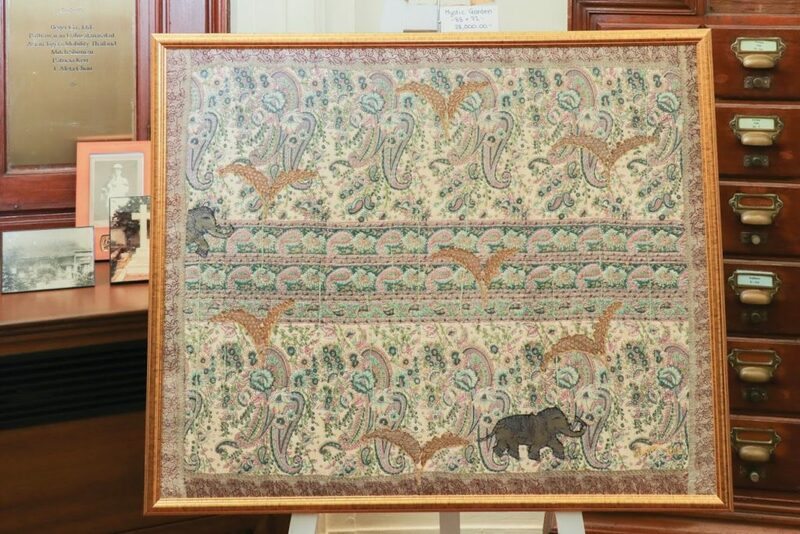 How did you transition from quilting to working with Indian saris? My mother-in-law gave me a trunkful of these old saris and I wondered what to do with them as they were old, stained and faded. I started making silk bedcovers for myself, and then for my family and friends. 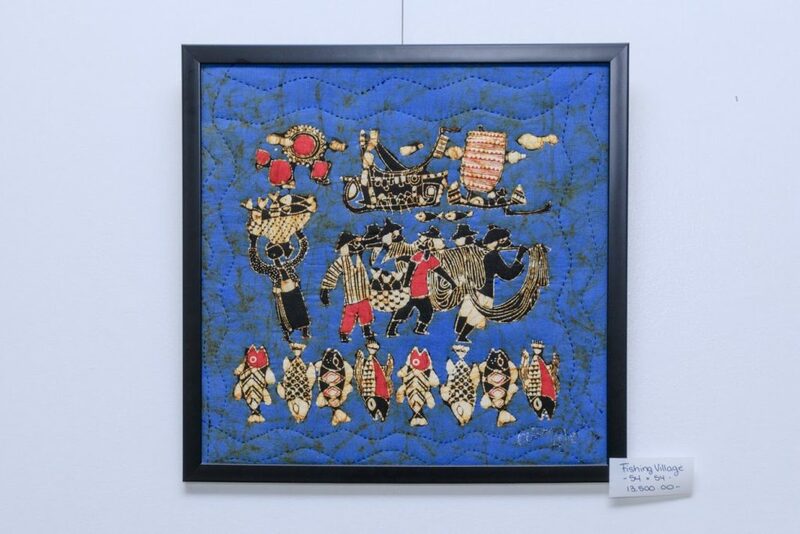 I only picked up the fabric artwork when we moved to Asia and saw an exhibition on fabric arts. By that point, the kids were already in university and I had more time to myself. I loved how the artists played with many materials, creating pictures and stories, and I felt like that was something I could do too. What is it about Indian saris that appeals most to you? I love the elegance of Indian saris, and the way there is already a story embedded in each one. The colour combinations are always so stunning. They are also very versatile, as there is a lot of fabric in one sari that can be used for multiple pieces of artwork. How do you decide on the themes of your artwork? It is based on instinct more than anything else. Sometimes I see a pattern that really strikes a chord with me and I decide I want to design a whole collection around that. Other times my artwork can be hanging there for weeks, and I’ll walk by it and see that something is missing, which could potentially spark another overall theme. Do you pick the saris you use in your work, or are they mainly gifts? I’ve never shopped for one. All of them have been gifts given to me by family and friends. I tell people about my work and they have been kind enough to pass on their old saris. What inspires you and do you have a specific creative process? It’s mostly about the colour. As for the process, I start by putting different fabrics together to see how they can work. I’ll lay them out on the floor and play with the arrangement of the cloth pieces until it looks right to me. After that, I’ll start cutting and sewing. Tell us about your recent exhibition called ‘Leafy.’ Why did you choose this particular theme? I got a sari from my mother-in-law that was filled with embroidered leaves. I loved the pattern so much; I wanted to create a collection around it. When I cut them out, I realised that they could also double as bird shapes. I felt that tied in nicely because birds represent freedom to me. Tiger and Remember Darjeeling. I love how the tiger seems to be moving if you look at the canvas from a certain angle. As for the other piece, I was born in Salzburg in the Alps, and it reminds me of the mountains there. Was it your goal to exhibit your work or did it come about unexpectedly? It became a goal of mine. I finished my artwork and then had them framed in my house. I thought they looked great and I felt like they should be exhibited. I was already a member of the Neilson Hays Library and I knew they held exhibitions, so I called them up to ask and they said yes. Will you be hosting more exhibitions in the future? Yes. 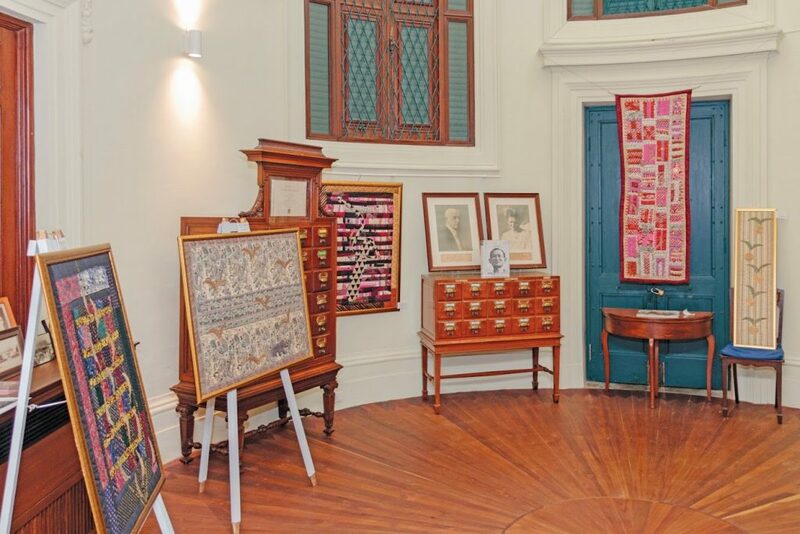 The next one will take place during the first week of August at the Austrian Embassy. They will be celebrating 150 years of friendship between Thailand and Austria. What are you hoping to achieve creatively in the next few years? I want to take it to the next level by making the pictures even bigger and more artistic. I would also like to add some painting into my work. When the base is finished, instead of adding other cloth pieces, I’ll paint. I see it as a challenge because it’s tricky combining both cloth and paint in a seamless way. What do you want people to take away from looking at your art? My work is generally positive and light-hearted, so it’s the best feeling to see people smile. I also enjoy being able to personally share the story behind the art to enhance their viewing experience.